Last year, I was part of an adventure where we went island hopping for four days. It was epic. And since then I’ve tried to join these adventures organized by Outdoorsman’s hub, but it seems the universe is not on my side, or should I say my schedule was a mess. I keep on skipping those activities, until the day we went on a 2-Day trip to Guintarcan Island. Does the island ring a bell? No. I thought so. Because this is not a common destination. In fact, I never heard of it until the Facebook group organized the trip. The unknown island made my heart pump faster. And so the Fickle Feet wanted to be on that island. Just so you know. Guintarcan Island is a part of Bantayan group of islands, in the province of Cebu. The locals call it as Kinatarkan. 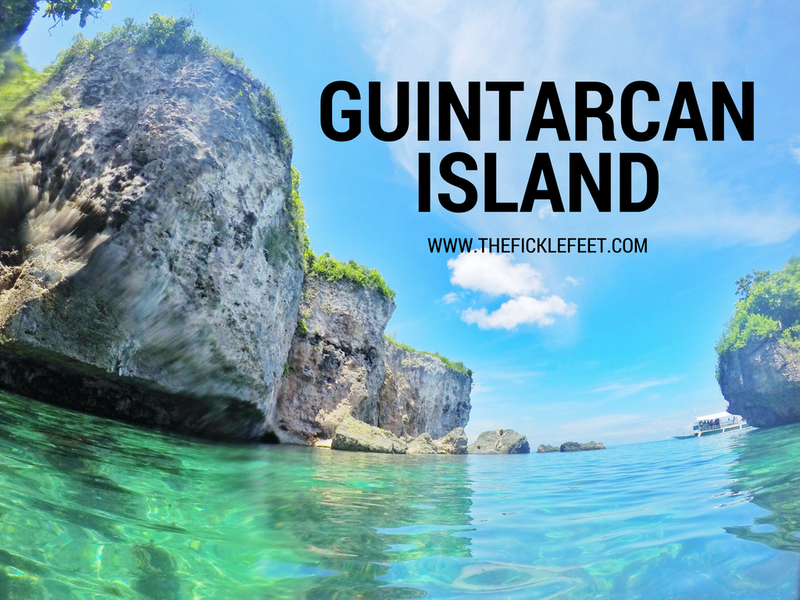 How to get to Guintarcan Island? From Cebu City – Take a bus in North bus terminal going to Daan Bantayan. From Daan Bantayan – If you are in a group and want to rent a boat. It may cost Php1500-3000. Not sure of the rate since our trip was organized and had a fixed price. But you can also take a boat for Php50 as a regular passenger. As we were heading to the Lagoon, we passed by this Cove. Since our boat cannot go near, we have to swim our way to get to the island. We passed by a tunnel-like rock. Also, we climbed and conquered those rocky cliffs. And then got lost on our way and went back from the beginning. So if you’re going there. Remember this, after the climb, go RIGHT. Don’t get lost. You might find a dead end like we did. The La-aw Lagoon is a small inlet located inside the island. It is partially blocked by huge rocks that we passed by. The water is greenish since there’s a lot of seaweed under the water. It is quite scary actually. But regardless of that fact, it was a beautiful paradise. After passing the tunnel, the climb on the right side is the way to the lagoon, the climb to the left side is the way to the cliff jump. Be careful on your way because the area is rocky. The cliff jump is almost 15 feet. We did some snorkeling in the La-aw cove. There’s not much to see, but it was still fun. I’m suggesting this because this is what we did. But I must tell you that it was quite difficult to find comfort rooms in the island since it is not commercialized yet. However, the locals are nice and you can ask them to help you to do your business. In other words, if you are seeking for some privacy and want to go in a secluded area. Guintarcan Island is for you. The only thing that will cost you is the travel expense. Little cost for a wonderful paradise. This lagoon looks so beautiful and untouched. I’d love to visit the Philippines and have added this to my list of places to visit there. Thanks for sharing. hi! where do we get off at Daanbantayan to rent pumpboats to Guintarcan?